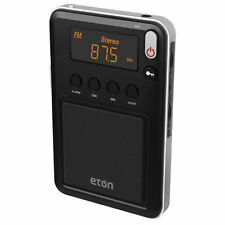 "Eton Mini Compact AM/FM/Shortwave Radio, Black (NGWMINIB)"
This has been tested and is in good working condition. It can be charged by a micro usb cord(not included) or by solar power. A small piece of the rubber is starting to peel off(see pictures), but it works great! Eton NSP101WXGR Scorpion ll Rugged Portable Multi-Purpose Digital Radio with Crank Power Back-Up and Weather Alerts. NOAA Weather Alerts so you know what's coming your way. BOX HAS FEW DAMAGES BUT IT HAS NEVER BEEN OPENED OR USED. 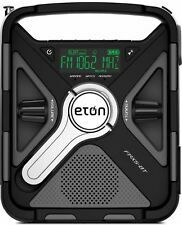 ETON FRX3 Hand Turbine AM/FM Weather Alert Radio and Portable Phone Charger . Condition is New. Shipped with USPS Priority Mail. Eton FR600 Solarlink Digital AM/FM/SW/NOAA S.A.M.E. Weather Radio Crank Power. Condition is Used. Shipped with USPS Priority Mail. [MINT Condition/Tested] ETON FR-250 Emergency Crank/Battery Operated Radio. Shipped with USPS Priority Mail. 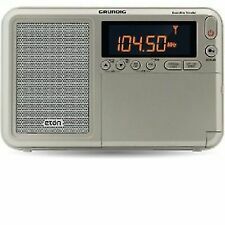 Hand cranked LL Bean Eton Microlink 150 hand cranked radio AM/FM and Weather bands. Receives AM/FM radio stations. Receives NOAA weather band radio stations. I have 3 of these units available. Radio is In Perfect Unused Condition. The Leather(Pleather) is cracked and pealing along the creases. 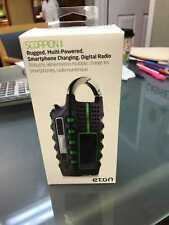 ETON Scorpion II Rugged Multi Powered Smartphone Charging Digital Radio Complete with Box Never Used. This affordable portable receives AM (530-1710 kHz), FM 88-108 MHz, and NOAA weather channels. The FR300 operates from a wind-up generator, or 4.5 VDC. Two turns per second for 90 seconds will provide 40 to 60 minutes of operation. American Red Cross FR1 Emergency Weather Alert Radio with Smartphone Charger. Condition is New. Shipped with USPS Priority Mail. Color red, with LLBean logo. SEALED, New condition. Digital tuner and display for precise tuning and reception. NOAA Weather Alerts so you know what's coming your way. AM/FM/Longwave/Shortwave bands. Single Sideband (SSB) with /1 kHz Tuning. Single side band (SSB) with 1 kHz tuning. FM with rds. (Radio data system). FM with RDS (Radio Data System). Vhf aircraft band. Eton Grundig AM/FM world receiver. Uses AAA batteries (not included). FM with RBDS (radio data system). New 2006 American Red Cross FR300 by Eton Emergency AM/FM Radio TV Flashlight . Only taken out of box for photos. Shipped with USPS Priority Mail. 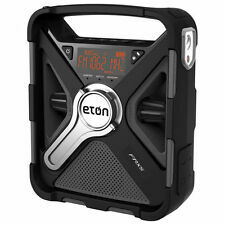 ETON FR-250 Emergency Rechargeable Battery Works Crank/Battery Operated Radio Next to no use. Protective film still on sw knob. Crank it up and The rechargeable battery holds charge. (For how long I do not know). But works for the few minutes I tried it out. Never exhausted the rechargeable battery. Incredible working and cosmetic condition. Please see pictures. Thanks and enjoy! 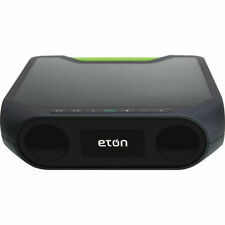 Eton FRX2 Hand Turbine AM/FM/Weather Radio New in the Box. headphone output. This handy radio features AM/FM/Weathe Band Analog radio. Hand Turbine Power. 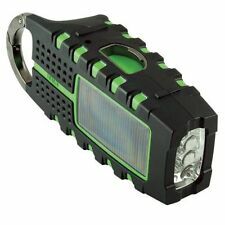 LED Flashlight. NOAA Weather Radio. 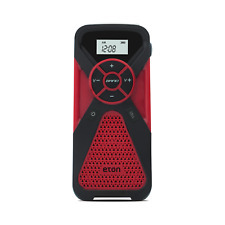 Eton Grundig Mini Compact Edition AM FM Shortwave Radio Black Grundig has been synonymous with superior shortwave performance. You can tune in to your favorite local stations or listen to news and music from across the globe. Used. It is dirty and a little sticky. I don't know whats on it. Has a new rechargeable battery. Works. With an all-terrain design and all-out stereo sound, the Rugged Rukus is ready for fun! Connect your Bluetooth enabled device wirelessly and you can start blasting your favorite tunes in stereo sound. When I say "work fine", I haven't tested all of the power sources, but I can safely say that everything works in the hand-crank mode. For testing purposes, I installed three batteries, and the radio, TV, weather, light and siren features all worked fine. The radio is in great condition, showing little more than light wear, and works great. It operates on 3 AA batteries (not included), AC adapter (not included) or the power generator. Trending at $19.42eBay determines this price through a machine learned model of the product's sale prices within the last 90 days. Sold as is. It uses AAA batteries. The box is a bit worn out. AM/FM/NOAA Weather band S.A.M.E. And NOAA Weather alerts 2000 mAh rechargeable lithium battery Digital tuner and display. Rechargeable lithium battery. Refer to the PDF attached below in Technical Specification for User Manual and Spec Sheet. . It does work and has very little use. Model: FR800. Unit powers on via test adapter (not included) with working display. On a scale from 1 - 10, with 10 being in new or excellent condition, this item is rated as a8. All pictures are taken in house.